Mitochondrial injury and dysfunction are central to numerous diseases, from myocardial infarction to stroke, neurogenerative diseases, inborn errors of metabolism, and drug toxicity. While efforts to prevent or reverse mitochondrial dysfunction pharmacologically continue, there is tantalising evidence in the literature that damaged mitochondria could actually be replaced by transplantation. This is a nascent field, and the mechanisms underlying mitochondrial therapy effects are poorly understood, but recent reports demonstrate tissue salvage by infusion of isolated exogenous (or endogenous) mitochondria in preclinical models of stroke1, acute lung injury2, Parkinson’s disease3 and cardiac ischemia (preclinically4,5, and clinically in children6). It appears that isolated mitochondria are not allergenic, and while they have been demonstrated protective when delivered by local tissue injection, they can also enter tissues even when injected systemically7 and may actively enter cells by a macropinocytotic process8 (which might be exploited to enhance targeting to damaged tissues). Many preclinical studies evaluating mitochondrial transplantation have utilised models of arterial ligation to induce ischaemic injury in brain or heart. While they provide promising results, such models are not ideal: mitochondrial delivery into poorly perfused tissue is difficult; delivering mitochondria to tissues already vulnerable to ischaemia may limit their potential for repair; and mechanistically it is difficult to determine whether mitochondria can actively target compromised tissue when their delivery may be affected by regional differences in perfusion. We propose a better approach: we have recently demonstrated that chemotherapeutic anthracyclines cause cardiac mitochondrial dysfunction and energetic compromise, but cardiac perfusion is unaffected. Thus, once anthracyclines have washed from the heart (~48 hours post-administration), delivery of therapeutic mitochondria should be efficient and more likely to deliver therapeutic benefit than in ischaemic tissue, and would be a more suitable testbed for determining the potential of mitochondrial transplantation, investigating the mechanisms involved, and optimising the approach before translation to other applications. We use isolated perfused rodent hearts in the development of PET, SPECT and MR imaging agents9-12. These models allow controlled delivery of oxygen, energy substrates, drugs etc., allowing induction of ischaemia, hypoxia, and other abnormal metabolic states (including cardiotoxicity), with real-time readouts of functional response. Coupled with a triple-gamma-detector system, we can evaluate radiotracer selectivity and pharmacokinetics in hearts over which we have absolute control13. We have a parallel setup which allows us to perform 31P NMR spectroscopy to measure cardiac phosphocreatine and ATP levels in response to challenge or therapy14. We have an ongoing program developing imaging agents targeting reactive oxygen species, hypoxia and mitochondrial function. We therefore have the capacity to study the cardiac accumulation of radio-(and/or fluorescently) labelled therapeutic mitochondria under controlled conditions, and characterise cardiac response to such therapy through contractile response, mitochondrial function, energetics, and metabolomics. We have also developed a subcutaneous osmotic minipump approach to slowly deliver chemotherapeutics in rodents to induce a clinically relevant cardiotoxicity, which we can characterise non-invasively using molecular imaging and echocardiography, and post mortem biomarker analysis. We will combine these unique platforms to develop, optimise and validate the potential for mitochondrial transplantation to rescue damaged myocardium. 1 Hayakawa, K. et al. Transfer of mitochondria from astrocytes to neurons after stroke. Nature 535, 551-555, doi:10.1038/nature18928 (2016). 2 Islam, M. N. et al. Mitochondrial transfer from bone-marrow-derived stromal cells to pulmonary alveoli protects against acute lung injury. Nature medicine 18, 759-765, doi:10.1038/nm.2736 (2012). 3 Shi, X., Zhao, M., Fu, C. & Fu, A. Intravenous administration of mitochondria for treating experimental Parkinson's disease. Mitochondrion 34, 91-100, doi:10.1016/j.mito.2017.02.005 (2017). 4 Masuzawa, A. et al. Transplantation of autologously derived mitochondria protects the heart from ischemia-reperfusion injury. American journal of physiology. Heart and circulatory physiology 304, H966-H982, doi:10.1152/ajpheart.00883.2012 (2013). 5 Kaza, A. K. et al. Myocardial rescue with autologous mitochondrial transplantation in a porcine model of ischemia/reperfusion. The Journal of thoracic and cardiovascular surgery 153, 934-943, doi:10.1016/j.jtcvs.2016.10.077 (2017). 6 McCully, J. D., Levitsky, S., Del Nido, P. J. & Cowan, D. B. Mitochondrial transplantation for therapeutic use. Clinical and translational medicine 5, 16, doi:10.1186/s40169-016-0095-4 (2016). 7 Cowan, D. B. et al. Intracoronary Delivery of Mitochondria to the Ischemic Heart for Cardioprotection. PloS one 11, e0160889, doi:10.1371/journal.pone.0160889 (2016). 8 Gollihue, J. L., Patel, S. P. & Rabchevsky, A. G. Mitochondrial transplantation strategies as potential therapeutics for central nervous system trauma. Neural regeneration research 13, 194-197, doi:10.4103/1673-5374.226382 (2018). 9 Eykyn, T. R., Southworth, R. & Kozerke, S. Dynamic Nuclear Polarization and MRI for the study of cardiac metabolism. Heart. Metab. 55, 13 - 17 (2012). 10 Brennan, J. P. et al. Mitochondrial uncoupling, with low concentration FCCP, induces ROS-dependent cardioprotection independent of KATP channel activation. Cardiovasc Res 72, 313-321, doi:10.1016/j.cardiores.2006.07.019 (2006). 11 Handley, M. G., Medina, R. A., Paul, R. L., Blower, P. J. 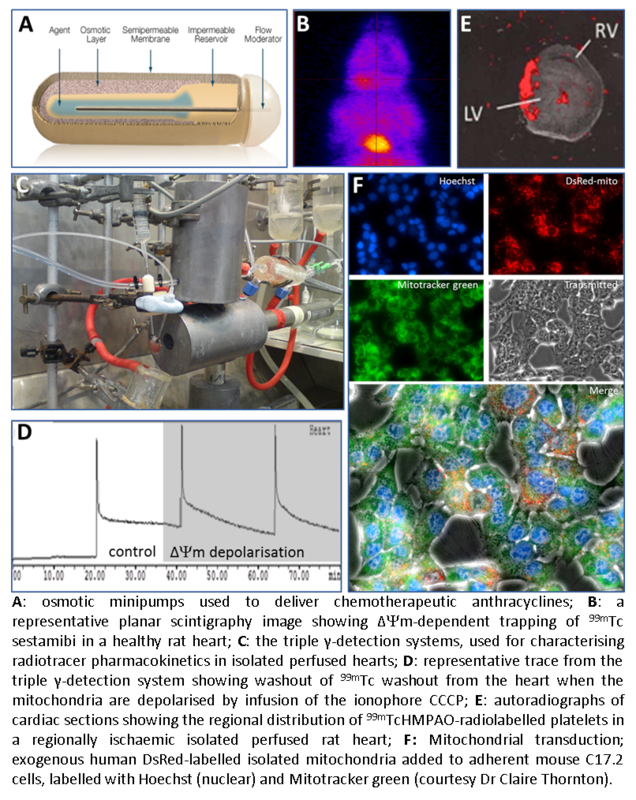 & Southworth, R. Demonstration of the retention of 64Cu-ATSM in cardiac myocytes using a novel incubation chamber for screening hypoxia-dependent radiotracers. Nucl Med Commun 34, 1015-1022, doi:10.1097/MNM.0b013e328363f25e (2013). 12 Dhanjal, T. S. et al. Trapped Platelets Activated in Ischemia Initiate Ventricular Fibrillation. Circulation: Arrhythmia and Electrophysiology, doi:10.1161/circep.113.000591 (2013). 13 Handley, M. G. et al. Cardiac hypoxia imaging: second generation analogues of 64Cu-ATSM. J.Nucl.Med. 55, 488-494 (2014). 14 Medina, R. A. et al. 64Cu-CTS: A Promising Radiopharmaceutical for the Identification of Low-Grade Cardiac Hypoxia by PET. Journal of nuclear medicine : official publication, Society of Nuclear Medicine 56, 921-926, doi:10.2967/jnumed.114.148353 (2015).